First: Create a daily habit of gratitude. There are many ways to do this, but this is my family’s practice and it’s turned out out to be very easy to maintain: every day, ask your kids to name one thing they are grateful for and share one thing you are grateful for. It’s important for parents to do this too and that it’s done daily. Role models and repetition are key factors in kids learning. You can do this when ever it makes the most sense—bath time, bedtime, driving home from school. But I’d really recommend doing it during dinner with the whole family present. Last year, we started doing “Roses and Thorns” during dinner and it’s proven to be a major, positive shift for all of us. I realize that it may sound a bit corny or silly, but the simple act of each of us focusing on the good in our days has created a more upbeat, grateful atmosphere (and it’s not like were Negative Nelly’s to start). In addition to taking our already generally optimistic points of views up a few notches, it’s also improved communication by allowing us all to talk about the little things in our days that affect our moods and life outlooks. What is “Roses and Thorns?” It’s simply each person saying what the best thing was about their day and the most annoying thing about their day. Why does this help your kids (and you)? A number of psychology studies have cited that gratitude is a strong and consistent link to greater happiness. This marked improvement between got us thinking—what are other ways we could foster gratitude and positivity? After a little bit of reading and reflection, Steven and I came up with the remaining things that would be easy to implement yet make a big difference. Second, when challenges and difficulties arise, talk through any positive aspects of the situation. Our daily “Thorns” discussion give the perfect opportunity to work through this with our kids. It allows you all to end a tough moment on an upbeat note and shifts the focus off the negativity. Kids struggle when things don’t go their way so by us helping them see that even in the worst moments, there’s often a ray of sunshine through the clouds. Again, focusing on the positive, even if it is a tiny one, will show kids that there’s a lot to be grateful for even during difficult times. It’s important to keep in mind that your kids should be the ones to determine what the positive part of the tough situation is. You can guide them there if they get stuck, but it needs to be a habit fostered within their own point of view. It’s also fine for you to point out other positives that they may have overlooked once they talk about their positive point. Just be careful not to get preachy or directive here—the lesson will get lost a la the Charlie Brown’s teacher voice phenomenon. Ask open-ended questions and they’ll find their own way there. Third, find a special way to mark those moments of “extra” gratitude within your family. Steven and I have tried to do this for years with doing things like giving special little gifts or outings to the girls when they do something selfless or particularly helpful. Steven has a stash of Lego Mini-figurines (which both girls love) that he will give to the girls when he sees something worthy go down and I tended to offer up trips to the ice creamery in town or a movie night with popcorn. We felt like we needed to do more because we weren’t consistent with these acknowledgements. Also the rewards were random and we often didn’t process that there was a need for a concrete way to mark when we did particularly kind things. Remember when I mentioned that gratitude was a habit? We had good intentions just hadn’t gotten to the point of it being a go to behavior. So, after a short brain storm, we came up with the idea of our Gratitude Cup. What’s a Gratitude Cup? It’s a physical item that can be passed from one family member to the next when they feel particularly grateful for something that they did. It’s up to the person that has possession of the Gratitude Cup to decide when to pass it to the next person. When we introduced the idea to the girls, we gave it to Isabelle for something she’d done for Reina (a special outing at the park) and I’d recommend waiting to start the practice until you have a moment that one of your kids created to hand it off for the first time so that more excitement is created around it. 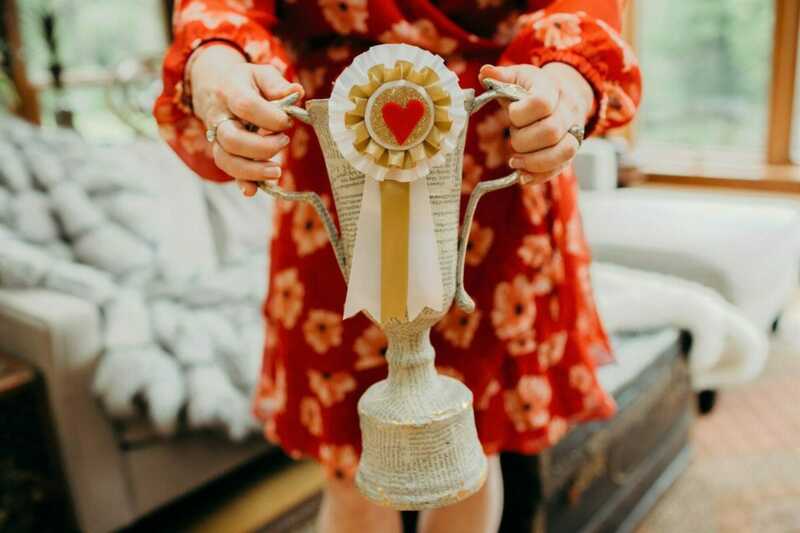 a handmade, particularly special DIY award ribbon; maybe mount it in an inexpensive frame for ease of display and passing along. a mason jar filled with something fun like gold star confetti and tied with a pretty ribbon. a simple 3D heart or star (look at paperweights online or at thrift stores) that if you wanted to spray paint &/or customize you could. something funny like a bobble head dog to denote being the “top gratitude dog” or Mother Teresa (yes Amazon sells this). a mason jar filled with coupons for the recipients “activity of choice;” you pre-fill the jar with moderately easy to do/pay for things like game nights, picnics, movie nights, baseball games, etc. These 3 simple practices have made a big difference in our house and I’d encourage you to try them too. Depending on your family, you may want to try all three ideas at once or work through them in stages. Given that habits take around 21 days to form, consider trying a new one every 3-4 weeks. Start with your version of “Roses and Thorns,” work up to longer discussions about the positives in challenging situations and then after a bit come up with your own gratitude cup. All photos by Nicole Vaughn. For more reading, check out Giving Thanks Can Make You Happier on the Harvard Medical Blog.